The latest technology to hit home and business security is the biometric safe, commonly referred to as a fingerprint safe. Biometric safes use personal and unique aspects of a person’s body or physiology to open the locking mechanism. Most of these safes use fingerprints, but retina scans, hand prints and voice tone are other common biometric triggers that can be used. The best biometric safes offer several advantages over keyed or combination safes. Fingerprint safes provide the highest level of security and fast entry for more than one authorized user. At BUYaSafe.com, we carry several models of biometric safes, including Biometric Mini Vaults. The Protex Fingerprint Wall Safe is perfect for small valuables, but the Biometric Mini Vault and Biometric Multi Vault were designed specifically for handguns. 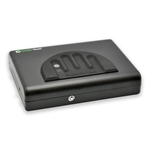 Another affordable option for the safe storage of pistols is the MVB-500 from MicroBioVault, which can be programmed for up to 30 users and includes a tamper indicator to log invalid entry attempts.